Figure 6-60. - Multiple-pass method of recycling. The reprocessing of a refrigerant to original production specifications as verified by chemical analysis is called "reclaiming." Equipment used for this process must meet SAE standards and remove 100 percent of the moisture and oil particles. 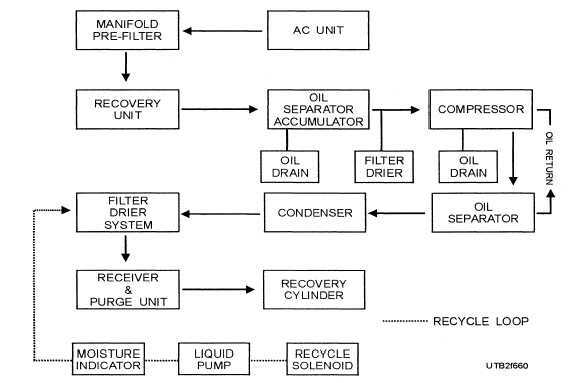 Most reclaiming equipment uses the same process cycle for reclaiming refrigerant. The refrigerant enters the unit as a vapor or liquid and is boiled violently at a high temperature at extreme high pressure (distillation). The refrigerant then enters a large, unique separator chamber where the velocity is radically reduced, which allows the high-temperature vapor to rise. During this phase all the contaminants, such as copper chips, carbon, oil, and acid, drop to the bottom of the separator to be removed during the "oil out" operation. The distilled vapor then leaves the separator and enters an air-cooled condenser where it is converted to a liquid. Then the liquid refrigerant passes through a filter-drier into a storage chamber where the refrigerant is cooled to a temperature of 38F to 40F by an evaporator assembly. To maintain a refrigerant system at a optimum operating condition sometimes requires removal or replacement of some component. Procedures for removal and replacement of some of the components most often requiring action are covered in this section. To help ensure good results in removing expansion or float valves, you should pump the system down to a suction pressure of just over zero. You should do this at least three times before removing the expansion valve. Plug the opened end of the liquid line and evaporator coil to prevent air from entering the system. Repair or replace the expansion valve and connect it to the liquid valve. Crack the receiver service valve to clear air from the liquid line and the expansion valve. Connect the expansion valve to the evaporator coil inlet and tighten the connection. Pump a vacuum into the low side of the system to remove any air.